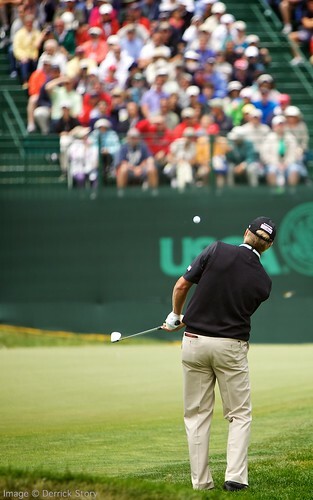 The 2012 US Open golf championships banned mobile phones, cameras, and video cameras. Banning a technology is a silver bullet approach to a problem. History from engineering to organizational change management suggests that silver bullets don't work. Our world is too complex and it's better to consider the variety of human, technical, and organizational options, in concert. The background is provided here, but to summarize, earlier in the year the PGA had lifted its ban on mobile phones at tour events. Yet, during the recent Memorial Tournament, marque players with large galleries were distracted by all the pictures being taken (a violation of the fan behavior rules), often with the sound options on. Course marshals confiscated over 100 phones (providing claim checks), but the issue apparently caused Phil Mickelson to text the PGA commissioner with his concerns. After the round, Phil withdrew from the Tournament citing fatigue. Finchem still said the tour has no plans to abandon its policy of allowing fans to bring phones into tournaments. Guidelines limit the use of phones to designated areas and prohibit photos or videos being taken during play. At the Memorial, fans weren’t following the rules and marshals weren’t actively policing the crowd, the commissioner said today. While I can't find mention of any rule change, it was certainly the case that phones and cameras weren't allowed during tournament play at the US Open last week, June 11-17. The next PGA tournament is the Travelers Championship starting June 21. 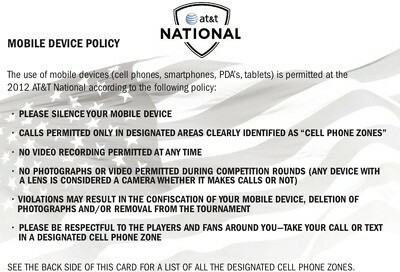 On their unique site they say mobile phones are allowed, but their PGA page cites PGA Tour rules as to why mobile phones and pagers are prohibited at tour events. Old boilerplate for their web site? Certainly confusing for fans. Multiple issues are at play as we see norms trying to adjust in the era of constant connection. Fans are still working out their own strategies - I was at a conference yesterday where the organizer mentioned that she'd been at the US Open and thought that leaving her phone at home gave her an improved experience. She continued by saying that she hoped we in the audience would consider turning our phones off and being fully engaged in the day's events -- while standing in front of her introductory slide which included the twitter hashtag for the conference. A staffer suggested that setting phones to silent mode might be enough. I argue that the right response is some combination of human, technical, and organizational choices made for the situation and even for the individual. Apparently the PGA decided that the US Open Championship deserved special treatment. At least one fan may volunteer to leave her phone at home in the future. Course marshals may develop new strategies for reminding people about the rules and consequences. Tournament organizers may shift from metal detectors to asking fans to show that mobile devices are in silent mode and that they understand about the no picture rule (more on that below). Perhaps a quick quiz with a sponsor give-way? One of our problems, however, is that we have had little support for how to make these decisions, or even for the creation of triggers highlighting that a decision needs to be made. That is a major topic in my book, The Plugged-in Manager, with the point being that decisions about how to plug in are not just about formal management, but management of ourselves as well. In the book, I offer three practices for plugging-in well, here I'll just talk about the first practice, Stop-Look-Listen. The idea is that you should stop and reflect on the available human, technical, and organizational aspects of the situation. Listening can mean looking to past research to help make current decisions. As I considered the issues around phones with cameras and cameras themselves I recalled an article by colleague Bob Sutton (yes, the Bob Sutton whose more recent work includes Good Boss, Bad Boss) on the role photographs play in people's memories of their trips to Disney's Magic Kingdom. While written in the time of cameras with film, the article suggests that the feelings people recall about their trips to Disneyland or Disneyworld are more positive than the feelings at the time of the visit. Also, that these positive memories are accentuated when photographs are available. The PGA understands how fan interaction can be enhanced with technology as can be seen with its enhanced mobile leader boards, social networking opportunities and the like. More people are able to attend tournaments during work days if they can stay reasonably connected with their organization via their mobile devices, not to mention the coordination benefits of being able to text one's friends at a giant sports facility. Might we find a way to allow pictures to be taken within the boundaries of the rules and players' needs? I hope the PGA remains committed to the new rules allowing mobile devices. I hope the US Open was an anomaly while they rethink how best to mix together the human, technical, and organizational aspects of the change. Here's to fans supporting course marshals as they enforce the new rules. Here's to all of us letting the players do their best, while still getting the most out of our attending an event.